There are many benefits to having a lift chair in your home. 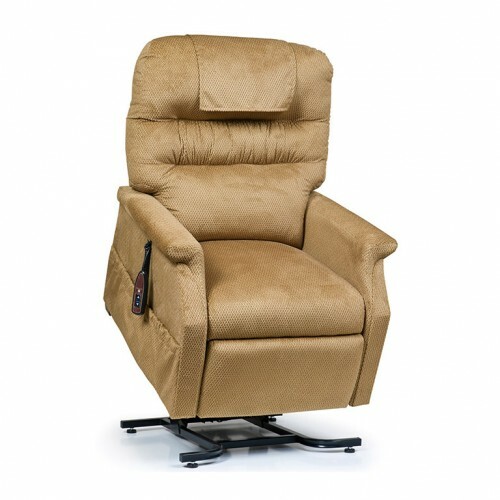 Lift chairs look and feel like regular recliner chair however have built-in features that help users sit/stand easily. These difficulties may be due to aging, arthritis or if you have recently had surgery done. Depending on the model, there are different features and levels of support provided to the patient. We rent lift chairs in Los Angeles and surrounding counties (San Fernando Valley, Orange County, Ventura County, San Bernadino County, Riverside County). Our rental lift chairs are from Golden Technologies, the leading manufacturer of lift chairs. We rent two models from Golden Technologies. The basic chair is the 3 Position lift chair, which has a very easy to use 2 button remote. The higher end model is the Zero-Gravity lift chair which does these same functions but also offers zero gravity positioning and allows the user to separately adjust the head and foot section. In-Home Delivery & Set-Up is available on our lift chair rentals. All Lift Chair Rentals are cleaned, sanitized, and tested before delivery to the customer. We offer same day or next day delivery on all of our Lift Chair Rentals. Call us today and speak with a highly trained customer service representative to schedule a Lift Chair Rental 818-705-0606! 100 lbs. 375 lbs. 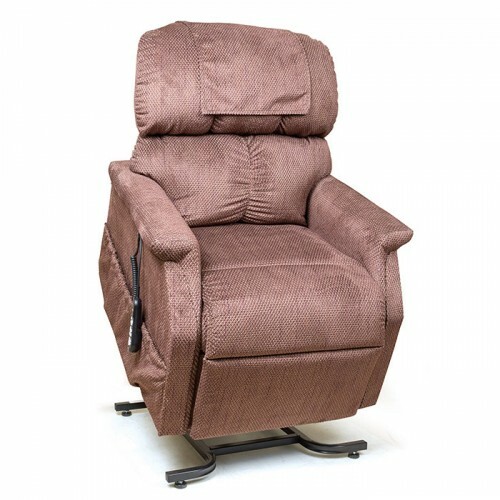 21", 23" 21"
A 3 Position Lift Chair has a single recline motor that will recline the back and footrest at the same time. The chair may be stopped in any position however it will not go flat. The lift chair stops at a comfortable napping position with the back slightly reclined and the feet fully elevated. A 3 position lift chair is very easy to operate with a simple 2 button remote. The remote has a down button that will recline the chair and an up button that will put the chair back in the sitting position then begin the standing lift function. 100 lbs. 300 - 375 lbs. 21", 22" 21", 22"
The Golden Zero Gravity Infinite Position lift chair is our best rental lift chair available. It features infinite positioning giving the user an infinite number of positions for comfort. The chair also has the Zero Gravity position which glides you into the pressure-free comfort of the Zero-gravity position, where the spine, hip and knee joints are balanced and positioned to provide natural relaxation and minimal muscle tension. The final feature the chair has is the lift function. This will slowly lift the chair up at an angle to help with standing and transferring out of the chair.